The pursuit of happiness is a global obsession. New research by Richard Davidson, Ph.D., of the University of Wisconsin found that humans have more control over their happiness than previously believed. Years back, it was thought that people’s happiness usually depended on the happiness of others to whom they are connected. This provided justification for seeing happiness, like health, as a collective phenomenon. But Davidson asserts that the “joy level” or the ability to feel happiness is already set at birth, and that a person’s current level of happiness depends on how their brain controls it. By attaching hundreds of sensors to detect brain activity, Davidson’s team tested this theory on monks—all of whom spent at least three years in a solitary, meditative retreat to master their emotions. The team showed them a series of photographs- some pleasant, some distressing –to see how their brains would react. They found that, when shown a pleasant picture, the brain produces normal levels of dopamine, a chemical that is commonly associated with the pleasure system of the brain and is naturally released when experiencing rewarding and happy experiences. But when shown a distressing picture, the brain secretes more dopamine than normal in order to curtail the negative emotion—almost forcing the brain to think happy thoughts. The amount of dopamine the brain can secrete is relative from person to person, which explains why some people get over their sadness much faster than others. At the end of the study, Davidson and his team concluded that people actually have more control over their happiness than is normally assumed. The mind has the ability to influence emotion for the positive. This does not mean that people do not have episodes of negative emotion, but that people have the ability to prevent those negative emotions from lingering. This may be the reason why Filipinos, despite challenging times, remain the happiest souls in Asia and the 14th happiest worldwide according to the New Economics Foundation—an independent global think tank. This new record makes the Philippines the only Asian country to be ranked in the survey's top 20 – with more developed countries such as the United States and the United Kingdom ranking 114 and 74, respectively. In the most recent survey conducted by the Social Weather Station, 79% of Filipinos say that they are very or fairly happy with their family, religion, friends, love life and health. Only 21% said that they were unhappy —making Filipinos a generally optimistic lot. It also showed that the youth, people aged 18 to 24 and 25 to 34, are the happiest groups in Filipino society, at 87% and 83% respectively. And while most people think that money is necessary for happiness, Filipinos who belong to the Class D income bracket also belong to the happiest income bracket despite their lack of material riches. Based on the SWS survey, one reason why Filipinos think they are happy is their religion. Interestingly, the happiest region in the Philippines is Visayas, at 82% and the region has numerous religious festivals such as the Sto. Niño and Sinulog Festivals in Cebu City, and the Dinagyang Festival in Iloilo City. And to further emphasize their joyful disposition, they dubbed Bacolod City, one of their major cities, as the City of Smiles. So, what could be the reason behind these numbers? This may substantiate Davidson’s claim that happiness stems from within—often regardless of external factors. 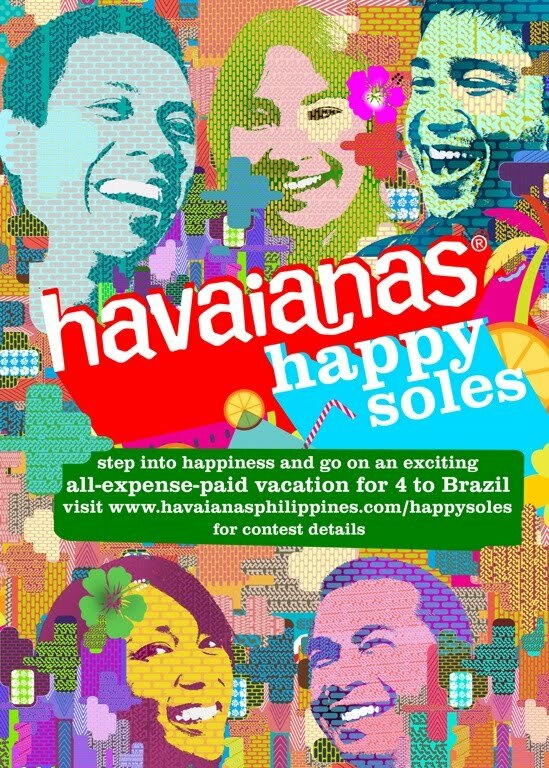 Such results prompted fashion brand Havaianas to launch the Happy Soles campaign that banks on the innate happiness of Filipinos. Known for its comfort, versatility, durability, and lovable design, Havaianas flip-flops have been a constant companion for Filipinos in their happiest moments –at the beach, at the mall, and everywhere else. This makes Havaianas both a witness and reminder of all the happy moments its owner experiences as he or she walks through life.